Augusta (US: /əˈɡʌstə/), officially Augusta–Richmond County, is a consolidated city-county on the central eastern border of the U.S. state of Georgia. The city lies across the Savannah River from South Carolina at the head of its navigable portion. Georgia's second-largest city after Atlanta, Augusta is located in the Piedmont section of the state. According to the U.S. Census Bureau, Augusta–Richmond County had a 2017 estimated population of 197,166, not counting the unconsolidated cities of Blythe and Hephzibah. It is the 122nd largest city in the United States. The process of consolidation between the City of Augusta and Richmond County began with a 1995 referendum in the two jurisdictions. The merger was completed on July 1, 1996. Augusta is the principal city of the Augusta metropolitan area, situated in both Georgia and South Carolina on both sides of the Savannah River. In 2017 it had an estimated population of 600,151, making it the second-largest metro area in the state. It is the 93rd largest metropolitan area in the United States. Augusta was established in 1736 and is named for Princess Augusta of Saxe-Gotha (1719–1772), the bride of Frederick, Prince of Wales and the mother of the British monarch George III. During the American Civil War, Augusta housed the principal Confederate powder works. Augusta's warm climate made it a major resort town of the Eastern United States in the early and mid-20th century. Internationally, Augusta is best known for hosting The Masters golf tournament each spring. The Masters brings over 200,000 visitors from across the world to the Augusta National Golf Club. Membership at Augusta National is widely considered to be the most exclusive in the sport of golf across the world. Augusta lies approximately two hours east of downtown Atlanta by car via I-20. The city is home to Fort Gordon, a major U.S. Army base. In 2016, it was announced that the new National Cyber Security Headquarters would be based in Augusta, bringing as many as 10,000 cyber security specialists to the Fort Gordon area. In 1735, two years after James Oglethorpe founded Savannah, he sent a detachment of troops to explore the upper Savannah River. He gave them an order to build a fort at the head of the navigable part of the river. The expedition was led by Noble Jones, who created a settlement as a first line of defense for coastal areas against potential Spanish or French invasion from the interior. Oglethorpe named the town in honor of Princess Augusta, the mother of King George III and the wife of Frederick, Prince of Wales. Oglethorpe visited Augusta in September 1739 on his return to Savannah from a perilous visit to Coweta Town, near present-day Phenix City, Alabama. There, he had met with a convention of 7,000 Native American warriors and concluded a peace treaty with them in their territories in northern and western Georgia. Augusta was the second state capital of Georgia from 1785 until 1795 (alternating for a period with Savannah, the first). Augusta developed rapidly as a market town as the Black Belt in the Piedmont was developed for cotton cultivation. Invention of the cotton gin made processing of short-staple cotton profitable, and this type of cotton was well-suited to the upland areas. Cotton plantations were worked by slave labor, with hundreds of thousands of slaves shipped from the Upper South to the Deep South in the domestic slave trade. Many of the slaves were brought from the Lowcountry, where their Gullah culture had developed on the large Sea Island cotton and rice plantations. The city experienced the Augusta Fire of 1916, which damaged 25 blocks of the town and many buildings of historical significance. As a major city in the area, Augusta was a center of activities during Reconstruction and after. In the mid-20th century, it was a site of civil rights demonstrations. In 1970 Charles Oatman, a mentally disabled teenager, was killed by his cellmates in an Augusta jail. A protest against his death broke out in a riot involving 500 people, after six black men were killed by police, each found to have been shot in the back. The noted singer and entertainer James Brown was called in to help quell lingering tensions, which he succeeded in doing. Augusta is located on the Georgia/South Carolina border, about 150 miles (240 km) east of Atlanta and 70 miles (110 km) west of Columbia. The city is located at 33°28′12″N 81°58′30″W﻿ / ﻿33.47000°N 81.97500°W﻿ / 33.47000; -81.97500 (33.470, −81.975). According to the United States Census Bureau, the Augusta–Richmond County balance has a total area of 306.5 square miles (793.8 km2), of which 302.1 square miles (782.4 km2) is land and 4.3 square miles (11.1 km2) (1.42%) is water. The Clarks Hill Dam is built on the fall line near Augusta, forming Clarks Hill Lake. Farther downstream, near the border of Columbia County, is the Stevens Creek Dam, which generates hydroelectric power. Even farther downstream is the Augusta Diversion Dam, which marks the beginning of the Augusta Canal and channels Savannah River waters into the canal. As with the rest of the state, Augusta has a humid subtropical climate (Köppen Cfa), with short, mild winters, very hot, humid summers, and a wide diurnal temperature variation throughout much of the year, despite its low elevation and moisture. The monthly daily average temperature ranges from 45.4 °F (7.4 °C) in January to 81.6 °F (27.6 °C) in July; there are 53 nights with the low reaching the freezing mark, 82 days reaching or exceeding 90 °F (32 °C), and 5.5 days reaching 100 °F (38 °C) annually. Extreme temperatures range from −1 °F (−18 °C) on January 21, 1985 up to 108 °F (42 °C) on August 10, 2007 and August 21, 1983. Snowfall is not nearly as common as in Atlanta, due largely to Augusta's elevation, with downtown Augusta being about 900 ft (270 m) lower than downtown Atlanta. Freezing rain is also a threat in wintertime. According to 2013 US Census estimates, the Augusta–Richmond County population was 197,350 not counting the unconsolidated cities of Hephzibah and Blythe. In the 2010 census, Augusta–Richmond County had 195,844 residents. The population density was 647.5 people per square mile (250/km2). There were 84,427 housing units at an average density of 279.5 per square mile (782/km2). The racial makeup of the city-county area was 64.7% Black or African American, 29.1% White, 0.3% Native American, 1.7% Asian, 0.2% Pacific Islander, 1.3% some other race, and 2.6% from two or more races. Hispanic or Latino people of any race were 4.1% of the population. In the city-county consolidated area the population was spread out with 24.6% under the age of 18, 12.6% from 18 to 24, 26.7% from 25 to 44, 24.8% from 45 to 64, and 11.3% who were 65 years of age or older. The median age was 33.0 years. For every 100 females, there were 93.8 males. For every 100 females age 18 and over, there were 90.7 males. The most-attended church is the Southern Baptist Convention, with 221 congregations with 114,351 members. The Catholic Church has 13 congregations and 31,687 members, while the United Methodist Church has 83 churches and 30,722 members. The National Baptist Convention had 26,671 members. The Presbyterian Church (USA) has 14 congregations and 4,500 members, the Presbyterian Church in America has 4,396 members in 14 churches. The Jewish community in Augusta dates back to the early 19th century. Today, there are two congregations, Congregation Children of Israel (Reform) and Adas Yeshurun (Conservative). There is also a Chabad-Lubavitch house. Around 1,300 Jews currently live in Augusta, who collectively support a Jewish Community Center. Augusta is a regional center of medicine, biotechnology, and cyber security. Augusta University, the state's only public health sciences graduate university, employs over 7,000 people. Along with University Hospital, the Medical District of Augusta employs over 25,000 people and has an economic impact of over $1.8 billion. Within the next few years, the city is expected to have rapid population growth of 10,000+ residents due to the announcement of the United States Army Cyber Command that will be located in Fort Gordon. 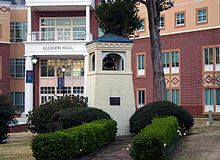 The city's three largest employers are Augusta University, the Savannah River Site (a Department of Energy nuclear facility) and the U.S. Army Cyber Center of Excellence at Fort Gordon, which oversees training for Cyber, Signal Corps, and Electronic Warfare. Despite layoffs from several companies during the U.S. economic recession and a relatively high state unemployment rate, the Augusta community has experienced a decrease in bankruptcy filings and saw a slight decrease in the unemployment rate from late 2009 to March 2011. However, these unemployment numbers are misleading as spring brings lower unemployment rates due to the Masters Golf Tournament. While unemployment fell to a two-year low of 8.3% in April 2011, unemployment rates have since risen to 9.9% as of July 2011. Companies that have facilities, headquarters or distribution centers in Augusta include CareSouth, T-Mobile, Covidien, Solo Cup Company, Automatic Data Processing, Graphic Packaging International, Teleperformance, Sitel, E-Z-GO, Elanco, Club Car (Worldwide Headquarters), John Deere, Kellogg's and Delta Air Lines' baggage call center. The Augusta GreenJackets minor league baseball club, formerly located at Lake Olmstead Stadium in Augusta, now play at SRP Park along the Savannah River in North Augusta, South Carolina. The team began to play in 1988 as the Augusta Pirates, affiliated with the Pittsburgh Pirates. Later affiliated with the Boston Red Sox, the GreenJackets are with the San Francisco Giants. The Augusta RiverHawks were a professional minor league ice hockey team. They played in the Southern Professional Hockey League (SPHL) from 2010 to 2013. They played their home games at the James Brown Arena. The Augusta Stallions were a professional Arena football team founded in 1999. They were one of the 15 original teams to join the inaugural 2000 AF2 season. They started off in the American Conference, before switching to the Southeast Division in 2001, and then the Eastern Division in 2002. The team folded in 2002. Augusta has an all-female flat track roller derby team, the Soul City Sirens. Founded in 2008, this league is all-volunteer and skater-owned. Augusta is also home to the former Augusta 706ers, a minor league professional basketball team in the American Basketball Association (2000–present). The team was founded in 2017 and stopped operations in December 2018 because of a lack of funds. The team played all home games at the James Brown Arena. The city's famous golf course, the Augusta National Golf Club, hosts the first major golf tournament of each year, The Masters. This tournament is the most prestigious in the sport and is one of the four major championships. The best professional and amateur golfers in the world come to Augusta during the first full week of April every year. The grounds of Augusta National are known for being pristine, and the course was ranked in 2009 as the third best golf course in the world by Golf Magazine. The city also has several disc golf facilities. The Augusta Top Gun Series is a series of tournaments sanctioned by the Professional Disc Golf Association. These tournaments are held at various venues in Augusta, including Pendleton King Park and Lake Olmstead. Also, Augusta hosted the 2006 Professional Disc Golf World Championships. Along with Pendleton King and Lake Olmstead, two courses in North Augusta, SC was used for the tournament. 299 disc golfers from around the world attended the event, with Ken Climo winning the tournament and his 12th world championship. Augusta hosted the Augusta Southern Nationals billed as "World's Richest Drag Boat Race" for 30 consecutive years. The event was held on the Savannah River near downtown in July until 2016. The race was part of the Lucas Oil Drag Boat Racing Series and was sanctioned by the International Hot Boat Association. The event benefited the Augusta Chapter of the Georgia Special Olympics with over 100 racing teams from 25 states competed annually for $140,000 in purse and prizes while trying to beat the course record of 252.94 miles per hour (407.07 km/h). Augusta is the site of the Head of the South Regatta. The youth rowing regatta is held on the Savannah River and is usually scheduled for early November. In 1995, citizens of Augusta and unincorporated parts of Richmond County voted to consolidate their city and county governments. Citizens of Hephzibah and Blythe, also located in Richmond County, voted against joining in the merger, which took effect January 1, 1996. The unified government consists of a mayor and ten commissioners. Eight commissioners represent single-member districts, while two are elected at-large, each to represent a super district that encompasses half of Augusta-Richmond's population. Public K–12 schools in Augusta are managed by the Richmond County School System. The school system contains 36 elementary schools, 10 middle schools, and the following nine high schools: Glenn Hills, Butler, Westside, Hephzibah, Aquinas, T. W. Josey, A.R.C. (Academy of Richmond County), Lucy Craft Laney, and Cross Creek. There are four magnet schools: C. T. Walker Traditional Magnet School, A. R. Johnson Health Science and Engineering Magnet High School, Davidson Fine Arts, and the Richmond County Technical Career Magnet School. Private schools in Augusta include Aquinas High School, Episcopal Day School, Saint Mary on the Hill Catholic School, Immaculate Conception School, Hillcrest Baptist Church School, Curtis Baptist High School, Gracewood Baptist First Academy, Alleluia Community School, New Life Christian Academy, Charles Henry Terrell Academy, Heritage Academy, and Westminster Schools of Augusta. Augusta Christian Schools, Augusta First Seventh-day Adventist School, and Augusta Preparatory Day School serve Augusta, but are located in neighboring Martinez. Augusta is linked to Atlanta to the west and Columbia, South Carolina, to the east by Interstate 20 (I-20). I-520 (Bobby Jones Expressway) extends from I-20 exit 196 through Augusta's western and southern suburban areas, eventually crossing the Savannah River to South Carolina, in which it is known as Palmetto Parkway. U.S. Route 1 (US 1), along with State Route 4 (SR 4), connects Wrens. US 1 also links Augusta with Aiken, South Carolina. US 25 and SR 121 connects Waynesboro with Augusta; across the state line, US 25 and South Carolina Highway 121 (SC 121) links Augusta with Edgefield, South Carolina. US 78/US 278/SR 10, known locally as Gordon Highway, connects Thomson with Augusta. In South Carolina, US 1 and US 78 go through Aiken, South Carolina. US 78 further connects with Charleston, South Carolina. US 278 bypasses Aiken and serves as a connecting route to Hilton Head Island, South Carolina. Until the 1960s the city's Augusta Union Station was a passenger rail hub, with trains arriving from the Atlantic Coast Line (as spur sections from Florence, South Carolina from trains such as the Palmetto), Georgia Railroad and Southern Railway (for example, the Augusta Special from New York City). The last train to the city was the unnamed daily in-state Georgia Railroad train between Atlanta and Augusta. This latter train, unofficially called The Georgia Cannonball, ran as a mixed train, until May 6, 1983. Most trains went to the Union Station at Barrett Square. The Southern Railway trains went to the Southern Railway depot at Fifth and Reynolds Street. Today freight service is handled by Norfolk Southern Railway's Georgia Division and Piedmont Division through their Augusta Yard and Nixon Yard located near the city. Norfolk Southern Trains such as the NS 191 and 192 pass through Augusta's downtown as they "street run" at 5 mph down 6th street. They also cross the old Trestle over the Savannah River in and out of South Carolina. CSX Transportation Atlanta Division and Florence Division Trains serve the Augusta, Georgia area too from the CSX Augusta Yard near Gordon Highway southwest of the city. ^ a b c "History". ^ a b "2017 U.S. Census Estimates–List of Places". U.S. Census Bureau. Retrieved May 24, 2018. ^ "Population Estimates". United States Census Bureau. Archived from the original on May 22, 2014. Retrieved February 3, 2015. ^ "USPS.com® – ZIP Code Lookup". Archived from the original on November 23, 2010. ^ Writer, Staff. "Get your digits straight - chronicle.augusta.com". chronicle.augusta.com. ^ "762 on way to phone near you". ^ "Augusta", in The Concise Columbia Encyclopedia (New York: Columbia Univ. Press, 1994), p. 56. ^ Robertson Jr., Thomas Heard (2002). "The Colonial Plan of Augusta". Georgia Historical Quarterly. 86 (4): 511. ^ "Coweta Town historical marker". KVWE-TV. Retrieved June 23, 2018. ^ a b "Freedom On Film: Civil Rights In Georgia". ^ "Baltimore is Everywhere," New York Magazine, May 18–31, 2015, p. 33. ^ "NowData – NOAA Online Weather Data". National Oceanic and Atmospheric Administration. Retrieved September 4, 2016. ^ "Station Name: GA AUGUSTA BUSH FLD AP". National Oceanic and Atmospheric Administration. Retrieved September 4, 2016. ^ "WMO Climate Normals for COLUMBIA/METRO ARPT SC 1961–1990". National Oceanic and Atmospheric Administration. Retrieved September 4, 2016. ^ "Census Of Population And Housing". U.S. Census Bureau. Archived from the original on July 9, 2009. Retrieved February 3, 2015. ^ "Population of the 100 Largest Cities and Other Urban Places in the United States: 1790 to 1990". U.S. Census Bureau. Retrieved August 7, 2014. ^ a b c "Profile of General Population and Housing Characteristics: 2010 Demographic Profile Data (DP-1): Augusta–Richmond County consolidated government (balance), Georgia". U.S. Census Bureau, American Factfinder. Archived from the original on September 11, 2013. Retrieved January 6, 2012. ^ Seymour & Associates | The Bankruptcy Lawyers. Augustageorgialawyer.org (July 1, 2013). Retrieved on August 9, 2013. ^ Unemployment Rate in Augusta–Richmond County, GA-SC (MSA) (AUGU213URN) – FRED – St. Louis Fed. Research.stlouisfed.org (July 30, 2013). Retrieved on August 9, 2013. ^ "Delta closing two U.S. call centers". USA Today. September 8, 2010. Archived from the original on June 22, 2006. ^ "About Greenjackets Baseball". The official site of the Augusta Greenjackets. Retrieved May 21, 2011. ^ Fans Vote Augusta River Hawks As Hockey Team's Name. Thesphl.com (March 13, 2010). Retrieved on August 9, 2013. ^ Super Bowl, World Series, NBA Finals: None say 'class' like the Masters. Worldgolf.com (February 25, 2008). Retrieved on August 9, 2013. ^ 1939–, Cox, Jim, (2011). Rails across dixie : a history of passenger trains in the American South. Jefferson, N.C.: McFarland. p. 246. ISBN 9780786445288. OCLC 609716000. ^ "Twin towns, Biarritz official website". Biarritz.fr. Archived from the original on July 29, 2013. Retrieved May 11, 2013. "Augusta, a city of Georgia" . The American Cyclopædia. 1879.